The Maritime Union of India (MUI) represents the Merchant Navy Officers who are it’s members. It is affiliated to the International Transport Workers’ Federation, London, U.K. that has to it’s affiliation more than 600 transport workers’ trade unions in over 135 countries and presents the interests of about 5 million workers around the world. MUI is also affiliated to the Hind Mazdoor Sabha, New Delhi, that has as it’s members a very large section of workers from various industries in India. MUI is thus lawfully represented on Government and Semi Government Maritime Boards and Committees. It also liaisons with various social and welfare organizations. The administration of the Union is being guided by the Executive Committee members who are elected periodically under the rules of the Indian Trade Union Act 1926. 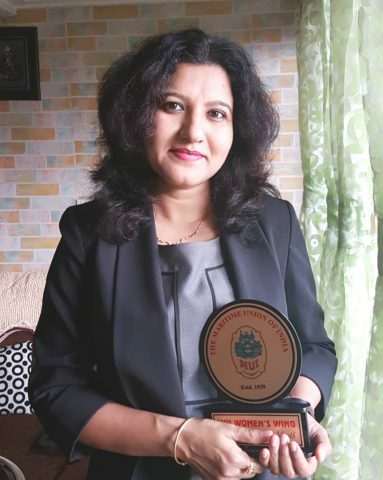 The Maritime Union of India has the support of eminent personalities and experts who are actively engaged in Legal, Medical, Maritime, Social, Welfare and Charitable activities. It publishes it’s home journal the OCEANITE every quarter and it is distributed free of cost to the members and the Shipping fraternity. The Union supports, participates and organizes medical awareness and welfare camps. The main objective and aim is to work for better terms and conditions of employment of the member Merchant Navy Officers. The Union enters into periodic agreement with the national and international shipping companies. By virtue of such periodic agreements it is able to establish welfare funds for the Merchant Navy officers and their families. The Union has branches/liaison offices in Kolkata, Visakhapatnam, Chennai and Tuticorin. It is planning to open a few more liaison offices in major port cities of India. The Union staff is well experienced and is capable of handling as well as extending guidance in the matter of taxation, legal, financial and medical awareness. MUI has an arrangement with United India Insurance Company Ltd to cover Merchant Navy Officers’ Certificate of Competency to support legal cost at the time of court proceedings. It firmly supports Government and all Maritime Organizations for the Merchant Navy Officers employment prospects, welfare and solidarity. It is ever ready to work as a partner with the shipping fraternity for the welfare of the Merchant Navy Officers in all spheres of maritime concerns, their development and prosperity. Now that there are women who have made great careers in the maritime industry it’s but natural that they too have a representation. I am a firm believer of gender equity; formulating a Women’s Wing is a step in this direction. I was a part of this historic moment. The MUI-WW was formally unveiled on 26th January 2018. The day will be marked in golden letters just as it became the Republic Day of India in 1950. 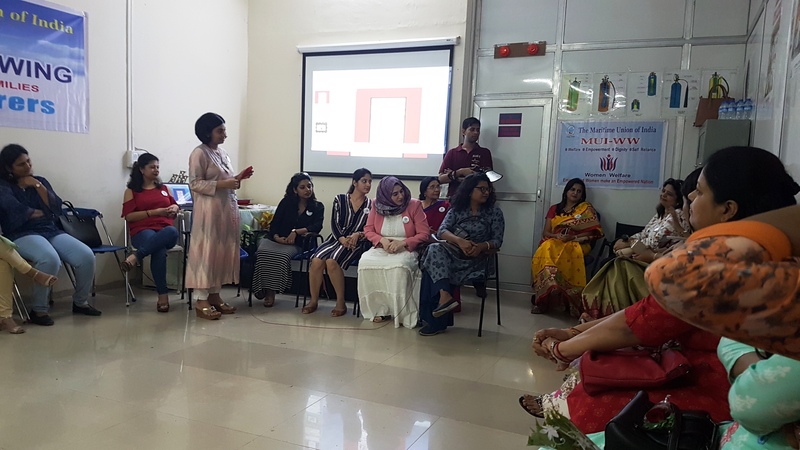 Ms. Saleha Shaikh, along with a team of self driven feisty women Ms. Lata Khatri, Ms. Pouruchisti Ukaji, Ms. Meeta Nigam and Ms. Laxmi Soneji who wanted to empower the other ladies were instrumental in creating the women’s wing the MUI-WW, on 26th January 2018. The ladies, wives of officers as well as women seafarers were registered as members. The MUI-WW thus had it’s first get-together at Mumbai. It was a great platform for collaborating and networking. The ladies had a great time interacting with each other over high tea. We all took a pledge to empower every woman and create space for fair representation, experience sharing, ideating; above all making the maritime fraternity robust! With the path already paved, the journey had to move forward and it did! 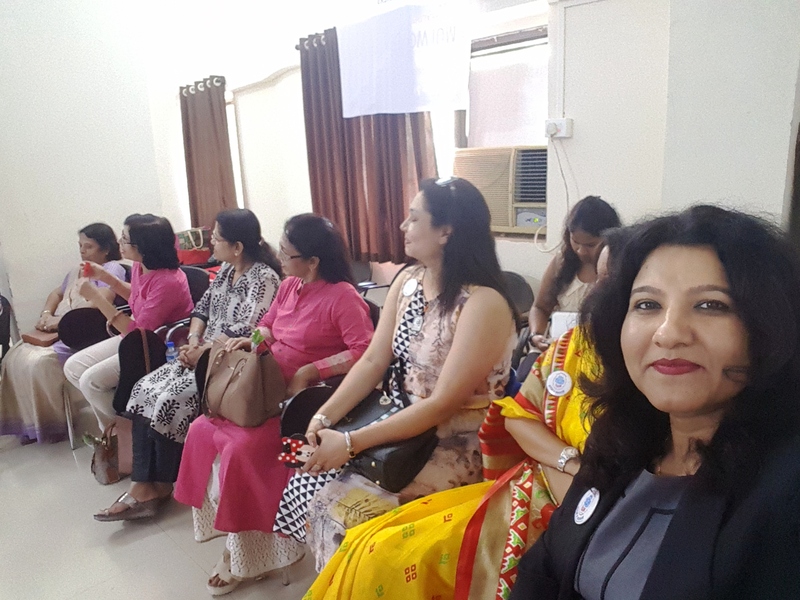 The second meet was organized at Celebrations Club in Lokhandwala, Andheri in Mumbai on 14th April 2018. The MUI-WW held an inspiring session on Cancer awareness. A detailed and informative talk by experts, followed by a Q&A session held the audience’s rapt attention. 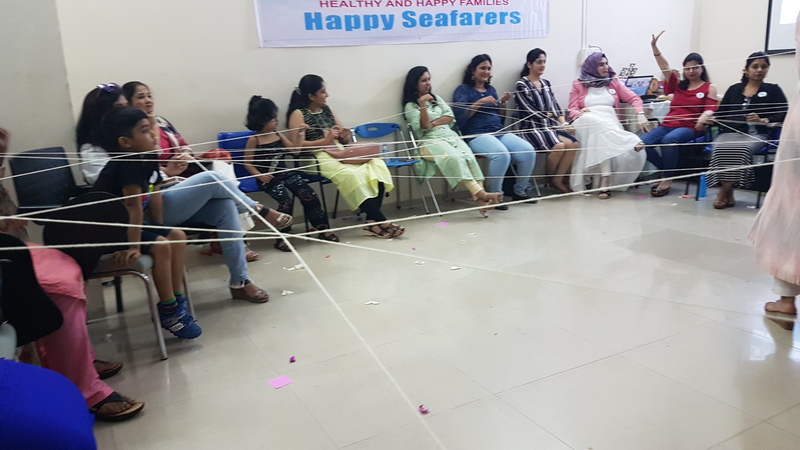 Announcement of the coveted ‘Personality of the month’ and of the Winners of the MUI-WW ‘Life at Sea’ Poetry Competition brought in some cheer to the sombre mood, followed by a fun time bonding over snacks and tea. I was travelling on work assignment but didn’t want to miss on the opportunity to catch up with the ladies. My long overdue meet with the charismatic Ms. Renuka Nayar finally materialized. It was great catching up with her and the causes that she supports specially connected with the welfare of sailors and their families. The event was as fulfilling as it promised to be. As I bid good bye, I was already looking forward to the next meet. 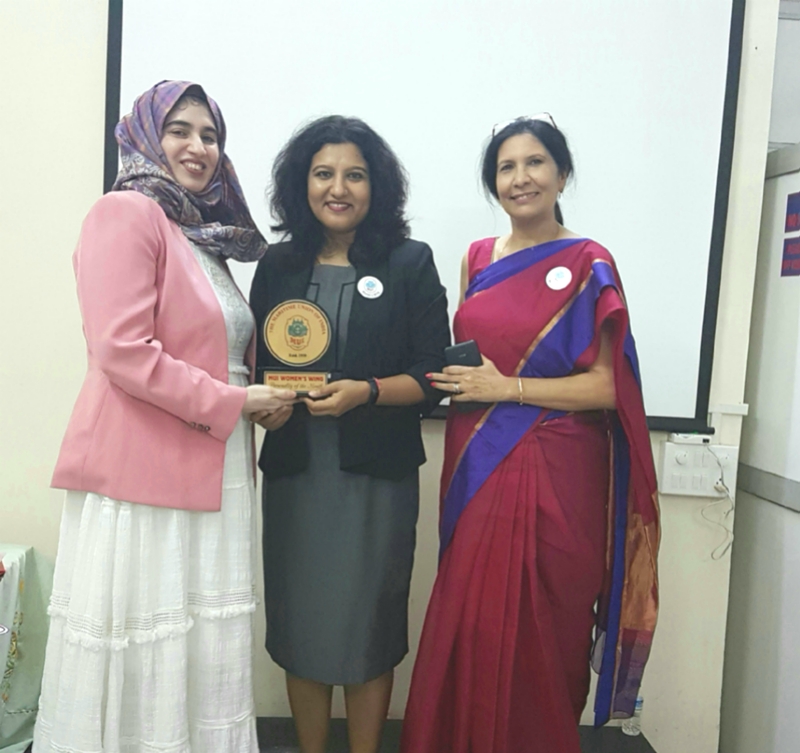 The MUI- WW meet this time was on the 18th of August 2018 at the Coral Maritime Academy, Navi Mumbai. Thankfully I was in town I could attend the event. The training topic for this get together was, ‘EQ is the New IQ’ The organising committee kept everyone posted on the event. I was so much looking forward to the interactive session. Being a trainer and coach myself, I love every opportunity that I get to meet others who do the same. It’s an activity that recharges my own batteries and brings about fresh perspectives. Ms. Ilham Modi did just that; she delivered a great training session. All the ladies found it quite apt, engaging and fun. The session was followed by felicitating the winners of DIY contest for children.Women shared their experiences of life at sea or that of being the land lubbers. The surprise of the day for me was being honoured by MUI-WW. I feel I hadn’t done anything apart from my own work- say personal or professional. It was truly humbling to be recognised as the personality that inspired others. This award is very special to me and will remain very close to my heart as it comes from the fraternity and me being my husband’s wife! I don’t really believe that I have done something out of the way or exceptional but this is a reminder to count my blessings of having very supportive parents, in laws and a husband who is my rock; tolerating my madness as well as encouraging me always. I can’t take credit for my journey so far as it wasn’t carved alone; it has had contribution from my family, colleagues, friends and the organization that I work for. Also, it’s my belief that no man becomes great on his own and no woman becomes great on her own, its the people around them who bring out the best in them. Such honours only motivate an individual to strive towards excellence; and I too shall seek that excellence! Being married to a sailor does come with challenges of it’s own, due to the nature of the profession but being able to balance things is the name of the game. As it is rightly said that only the brave men go to the sea and only the bravest women marry sailors! I am certain that the sailor queens adore their men as they know it well that the sailor’s joys are as simple as a child’s. With such simple joys of life we all bid goodbye to each other with the promise of catching up soon with another interesting agenda with a good dose of fun.